In the introductory course in Sociology we wrote a Wiki. It was a short and enjoyable explosion of sociological thought-experiments. Students read the introductory textbook, selected a topic they were genuinely interested in, wrote a short article and posted it in the Wiki. In about 50 days students produced 90 Wiki-articles. The Wiki functioned as a digital classroom in which we could write a comment to each other’s texts. In the end 17 students selected their one best article. The screenshot shows the titles of these articles i then presented in ebook format. Extract from the Introduction to Eat drink sociology. Royal Academy for the Arts / Year 2015/16 / Educational Publication: ‘In supermarkets in the UK they used to sell wheat cookies with the brand name ‘Digestives’. I now refuse the nostalgic temptation to google if they still exist. It must be one of the most horrible brand names ever invented. But eating digestives made me feel ‘non-hungry’ and relatively happy for an hour or two. Now this is what we did in this introductory course in sociology: we ate some Marx and drank a bit of Durkheim and Hochschild, we mixed this with our own tastes, observations and interpretations. A small collection of articles is the relatively solid result in a liquid society. 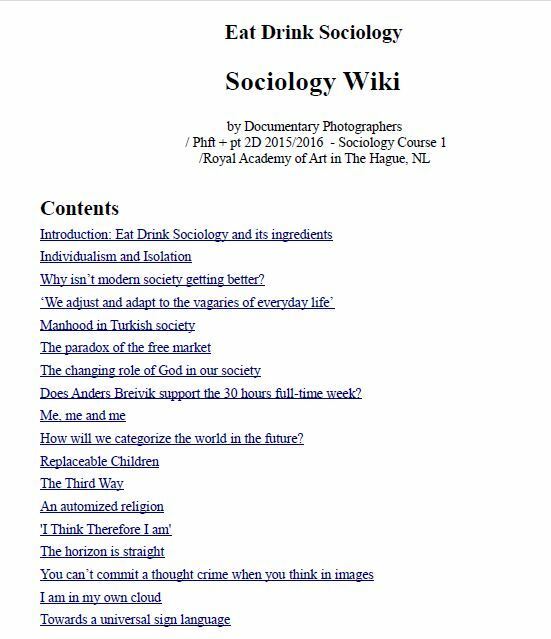 Basic ingredients we took from the book: Sociology by John Macionis and Ken Plummer (Pearson 5th Edition UK 2011); the Dutch version: Samenleving by Macionis, Peper and Van der Leun (Pearson 2014). We digested one chapter a week, on cultures, societies, groups, identities, everyday life. Some chapters were easy to digest, other chapters needed more effort or a make-over with some help of new thoughts and experiences. The articles were written for the Wiki during a short introductory course on Sociology for documentary photographers (2nd year 2015/2016). The Wiki was hosted at Wendorf Academy and powered by NEO, a Learning Management System (LMS, formerly Edu2.0). And this teacher would like to say great thanks to all students for their reading, thinking and writing.